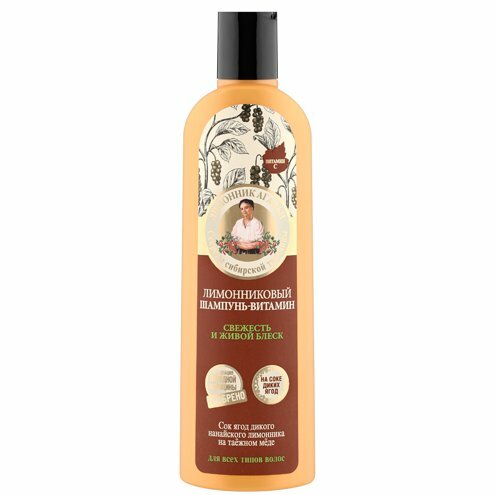 Agafia’s Schisandra Shampoo is produced by the Russian beauty brand Granny Agafia’s Recipes for its 5 Juices series. It is specifically designed to keep the hair fresh and shiny. Suitable for all hair types. The product restores your hair’s strength and shine, helps to keep it clean for a long time. Formulated with Nanai schisandra berry juice which is known as one of the most effective energising remedies used in traditional medicine of the Far East. Agafia’s shampoo contains soapwort extract which is rich in saponins (natural foaming agents and detergents) so it cleanses your hair and scalp very delicately yet effectively. Taiga honey contained in the shampoo nourishes hair follicles, while cranberry seed oil moisturises the hair and improves its elasticity. The product is enriched with vitamin C. Its formula is approved by the Association of Traditional Medicine. Directions. Apply onto wet hair, lather, rinse with clean water. Repeat if necessary. Ingredients. Aqua with infusions of Schizandra Chinensis Fruit Juice, Mel, Saponaria Officinalis Root Extract; Sodium Coco-Sulfate, Sodium Chloride, Cocamide DEA, Cocamidopropyl Betaine, Polyquaternium-7, Organic Vaccinium Macrocarpon Seed Oil, Ascorbyl Palmitate (vitamin C), Benzyl Alcohol, Benzoic Acid, Sorbic Acid, Citric Acid, Parfum. Want to buy Agafia’s Schisandra Shampoo? Call us or submit your order via our web site!